Adam, Brian, Carmen and Jeff discuss highlights and back stories from episodes of The Engineering Commons podcast that were released in 2014. Carmen and Adam explain why certain beers benefit from aging. We’re always looking for new guests to discuss their adventures in engineering, so if you’d like to join us (or you want to suggest a colleague), you can fire off an email to admin -=+ at +=- theengineeringcommons.com. Adam led us through a discussion of “Project Management” in Episode 47. Our next episode discussed “Women in Engineering” with guest Cherish Bauer-Reich. Mike Parks joined us to talk about the “Art of Engineering” in Episode 50. Mike produces the S.T.E.A.M. Power podcast. We digress into a discussion about wirewrapping. “Product Development” was the topic of our next episode, which featured guest Dave Young. We published our episode about “Engineering Pranks” on April Fool’s Day. An interview with Carmen will appear in an upcoming issue of Circuit Cellar. “Storytelling” was the subject of our conversation with Craig Sampson. Jeff recounts (once more) the central plot to Fredrick Pohl’s short story from 1954, “The Midas Plague,” in which the rich consume less, while the poor are forced to consume the glut of goods and services produced by robots. Pamela Rogalski spoke with us about “Social License” in our following episode. In the episode titled “Renaissance Engineer,” we talked with Janusz Kozinski about founding the Lassonde School of Engineering. “Nuts and Bolts” were discussed in Episode 66 and, amazingly, Brian feels like this was one of the more useful episodes that we’ve produced. Gary Bertoline spoke with us about engineering “Credentials” in our following episode. We learned about starting up a side business in our discussion with “Awkward Engineer” Sam Feller. Thanks to our listeners for downloading The Engineering Commons podcast! We hope you enjoy great success in 2015! 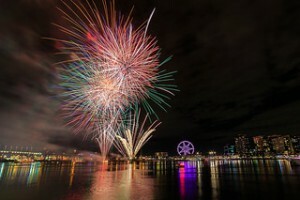 Thanks to Scott Cresswell for use of the photo titled “Docklands Fireworks (Explored! ).” Podcast theme music by Paul Stevenson. I really love your Podcast but there still seems to be an issue with your feeds. Both iTunes and FeedBurner only list 72 episodes and miss this current one. This happened before on several occasions where it took sometimes weeks for the episodes to show up in the feed. Sorry for the feed problems, Marc. Thanks for bringing it to our attention. Like many podcasts that started several years ago, we use FeedBurner to manage our podcast feed. (That way, even if we were to move our podcast to a new location, listeners would still receive our RSS feed by subscribing to the unchanged Feedburner address.) However, the FeedBurner service has not gotten much attention since it was bought by Google back in 2007. Thus, podcasters are slowly moving away from FeedBurner. Unfortunately, doing so requires existing subscribers to move to a new feed, and I’ve not wanted to inconvenience our audience in this manner. With regard to the trouble you identified, Marc, although our website was putting out a valid feed, FeedBurner seemed to think it was old material. However, I was able to force FeedBurner to resync the feed, and this seemed to fix the problem for now. I’ll try to keep an eye on this issue in the coming weeks. Again, my apologies for any inconvenience this has cause for you, or the rest of our listeners.